Time to re- write the RS Aero Brochure!! Twelve RS Aeros joined Ullswater YC's singlehanded open at beautiful Ullswater in Lakeland. The Northern Circuit once again enjoyed some fantastic weather conditions – Beautiful sunshine in an amazing setting and wind as well!! For most this was the last chance to hone skills in readiness for this years National Championship at Abersoch, North Wales later this week. Racing was held on PY with a mixed fleet of RS Aero 7s and RS Aero 5s. The RS Aeros gathered on Ullswater’s shoreline and having consulted the weather conditions several critical decisions were made on rig sizes…. Nobody went the full Dolly Parton (9->5) but Matt Thursfield and Iain McGonigal (The Flying Scotsman) switched from 9->7, Julie Archer, Nick Craven, Jackie Craven and Steve Stewart switched to RS Aero 5 rigs… The wind was from the East which is notoriously shifty on this long narrow lake and with gusts in excess of 30mph showing on some forecasts this could turn out to be a critical decision. The usual pre-race preparations of headache tablets and a mighty breakfast were complete and in the hands of an excellent PRO - David Clarke and team the event was underway. The format was to be short sprint races with quick turnarounds – credit to the race team, quick they were with no waiting around at all between races. Race one proved something of a settler with Matt Thursfield making a surprise appearance as the 5 minute gun went having been stuck on the M6. The gusts were huge and the Flying Scotsman took several almighty dips and used Race 1 for an early discard. The RS Aero 5 rig was paying off and seriously competitive on PY with Stewart 2nd & Thursfield 1st with only 2 seconds separating them for Race 1. The day developed with our International competitor, Arnaud Bouchez of France falling out of his boat giving Jackie Craven time to come through – however she missed it being far too busy laughing! Arnaud later sailed between Julie & Jackie – a brave strategy always avoided by the rest of the fleet so it came as something of a surprise to them. In these strong winds the RS Aero 5 rig consistently showed its pedigree; Race 2 finished with the results a familiar Thursfield 1 and Stewart 2, and a slightly bigger gap of 24 seconds but throughout each race the places changed regularly as any mistake cost places in a mixed fleet that were all finishing within 2 minutes for 1st & 12th place. Race 3 changed the pattern to keep everyone in contention – Stewart 1st & Archer & McGonigal = 2nd. In Race 4 good upwind strategy paid with Stewart 1st , Thursfield 4th and McGonigal 2nd, Noah Rees 3rd - clearly having recovered from his journey north from Cornwall. At the end of day one the results were Stewart, Thursfield, McGonigal, Archer, Rees, Lockey, N Craven, Atkin, Butler, J Craven, Bouchez & Fraser (Caitie Atkin was heard to say… “even Julie Archer’s in front of me” - that smaller rig pays in so many ways - Caitie was advised to talk less and sail more!!) 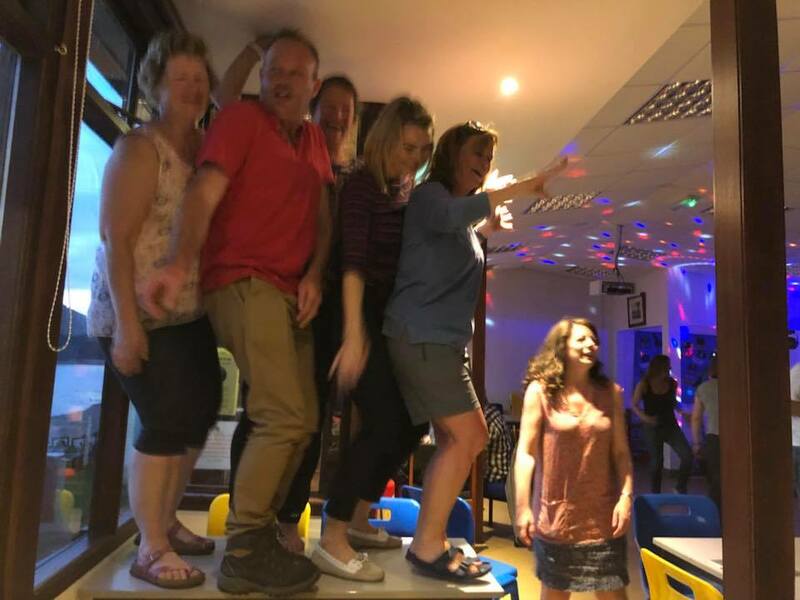 and with a party evening ahead it could all depend on what happened in those intervening hours… Ullswater Yacht Club had provided one of its famous live music nights; there was much singing, table dancing and pop drinking across all the fleets. The main topic of conversation with the RS Aero fleet being, is the 5 rig the new 9? Are you brave enough to us a rig designed for a “youth” – or will you stick with the RS Aero 7 for “women and light men”? None of to-days manly men were up for the RS Aero 9 rig for “men” in a 30mph Easterly when the ferries were cancelled but low and behold the youth rig, the pink and fluffy one came in to its own…. Are you man enough for it next time the wind blows? Can you sail it and still come out on top? Day two…. In which the Flying Scotsman Flew!! The slightly lighter forecast for day 2 never materialised and both Richard Butler and Arnaud Bouchez “manned up” to a RS Aero 5 rig, Jackie Craven wisely retired after the start of Race 5. Nick Craven who had been consistently mid fleet on day 1 excelled in Races 6 & 7 coming 3rd & 4th…. Again showing us what a real man can do in a RS Aero 5 rig with a good blow. Thursfield, Stewart & McGonigal continued to battle out each race but with McGonigal only managing a 6th in Race 6 after he blasted downwind and nosedived to complete a truly acrobatic Aero-Endo in which blue sky could be seen between him and his transom as he flew through the air to take an icy dive and still come up smiling. As the afternoon continued there seemed to be an increasing vortex around the finish boat with McGonigal meeting his demise in the same unexpected calm spot, "McGonigal’s Hole”, 3 times in succession, Keith Lockey sailing over the finish and then upside down and backwards off it again, by the time the last boat finished the Committee finish boat had as much fun as the sailors and we would like to thank UYC for another brilliant weekend. After the RS Aero UK Nationals at Abersoch the UK Northern Circuit reconvenes at Huddersfield SC for Round 4 on Sunday 10th June. Lovely Ullswater is no place to hurry away from...althouth here is a speedy pack up video of Noah roof topping his RS Aero. He has a roof bar right at the back of the roof making it easy to rest the bow on when lifting it up on his own. Photo: Another quiet night on the UK Northern Circuit!